During May 1968, students and workers in France united in the biggest strike and the largest mass movement in French history. Protesting capitalism, American imperialism, and Gaullism, 9 million people from all walks of life, from shipbuilders to department store clerks, stopped working. The nation was paralyzed—no sector of the workplace was untouched. Yet, just thirty years later, the mainstream image of May ’68 in France has become that of a mellow youth revolt, a cultural transformation stripped of its violence and profound sociopolitical implications. Kristin Ross shows how the current official memory of May ’68 came to serve a political agenda antithetical to the movement’s aspirations. She examines the roles played by sociologists, repentant ex-student leaders, and the mainstream media in giving what was a political event a predominantly cultural and ethical meaning. Recovering the political language of May ’68 through the tracts, pamphlets, and documentary film footage of the era, Ross reveals how the original movement, concerned above all with the question of equality, gained a new and counterfeit history, one that erased police violence and the deaths of participants, removed workers from the picture, and eliminated all traces of anti-Americanism, anti-imperialism, and the influences of Algeria and Vietnam. 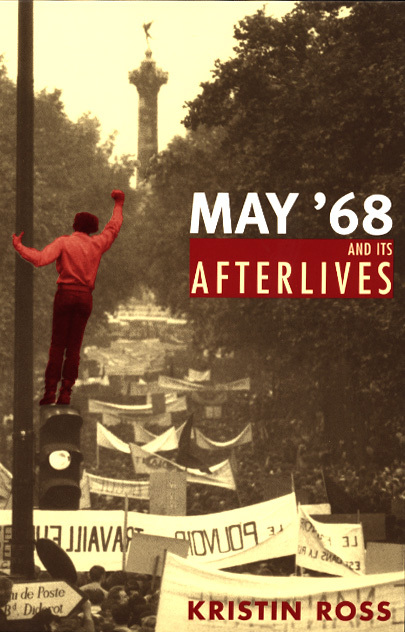 May ’68 and Its Afterlives is especially timely given the rise of a new mass political movement opposing global capitalism, from labor strikes and anti-McDonald’s protests in France to the demonstrations against the World Trade Organization in Seattle. "Vietnam Is in Our Factories"